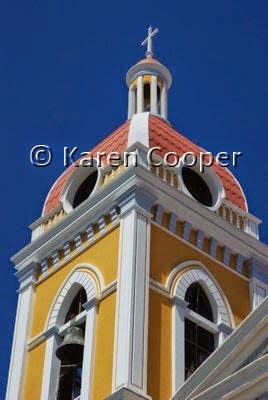 Granada City, Nicaragua was founded in 1524 by Francisco Hernandez de Cordoba. Granada is steeped in history and charm. From the tales of William Walker to the restoration of its many cathedrals, Granada is a city that can be discovered by all of your senses. I have fallen in love with this old colonial town. She sits on the edge of Lake Nicaragua and has a very cosmopolitan feel. People from all over the world live here. You can sit in sidewalk cafes in the evenings and hear several languages being spoken. The people that live and visit here are all very friendly and welcoming. A place to truly feel how small the world really is. I have yet to discover all of Granada. She holds hidden gardens and works of art. She tells her secrets slowly for those that want to hear the legends of time. I am looking forward to telling her stories. What a wonderful graphic and colorful picture! I LOVE it! I have a cousin stationed there. He works in the foreign service. Thanks to you now I want to go to Granada. Now, I just have to figure out where the money is going to come from? Now that is the question.